Superior of Bushnell is easy to find – just follow the row of sheds leading off Hwy 48 to the large display area in the back. Brian & Linda Sammons also have an RV & Outdoor Storage business – LOTS of ROOM! Brian & Linda moved from Michigan years ago and enjoy Bushnell and their property – take the kids and see the animal from goats to rabbits to a miniature donkey (he is the watchdog). They also have collectibles and enjoy vintage cars – take a look! Their annual sale of collectibles should not be missed. They treat customers like neighbors as that is how they view their business and community. The large display area features many sizes of sheds that are State of Florida Approved and rated at 180 MPH – check out the large 14′ wide sheds and the Cabana Style Shed! They offer Carports as well as Sheds. Brian also delivers his sheds and can help if you want to move a shed or need some advice. Real Local SERVICE with a SMILE! Rent to Own plans and Easy Financing. 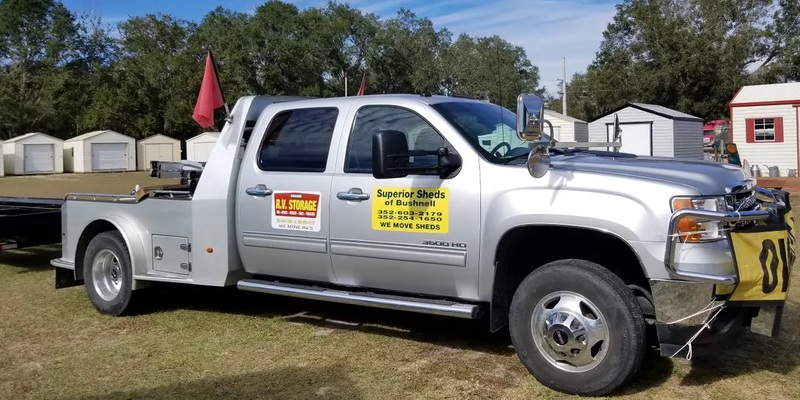 *Shed sales servicing Sumter County, Bushnell, Webster, Lake Panasoffkee, Villiages, Sumterville, Leesburg, Wildwood, Tarrytown, Nobleton, Adamsville, Coleman, Center Hill, and surrounding areas.